Thanksgiving evokes memories in us all, many from childhood. Preparing breakfast for guests at the Avenue Hotel Bed and Breakfast is possible because of the hours I spent in the kitchen with my mother. My mother loved to cook and she loved to eat good food. She also taught me how to read a recipe and know how that dish would taste. The many requests for recipes brought on the cookbook. With the completion of " Breakfast and Beyond" many of my memories have been stirred up. These are the rolls my mother always made for big holiday dinners; she had to tripled the recipe.This is from her now vintage Good Housekeeping Cookbook that has been passed down to me. 1) Combine first 4 ingredients in large bowl. Stir until shortening is melted, salt, and sugar dissolved. Cool to lukewarm or until a little of mixture dropped on inside of wrist feels almost cool. 2) Meanwhile, sprinkle yeast in lukewarm water; let stand 5-10 minutes until thoroughly dissolved. Stir up; stir into shortening mixture. 3) Break egg into small bowl; beat well. Add to shortening mixture. 4) Next add 2 cups of flour; beat well with spoon; slowly stir in rest of flour-or enough to make a dough easy to handle-not sticky. 5) Grease top of dough with salad oil; cover tightly with waxed paper or bowl cover, and damp towel; store in refrigerator. Use dough at once, or keep 2-3 days in refrigerator. Dampen towel as it dries; punch down dough if it rises too close to top of bowl. 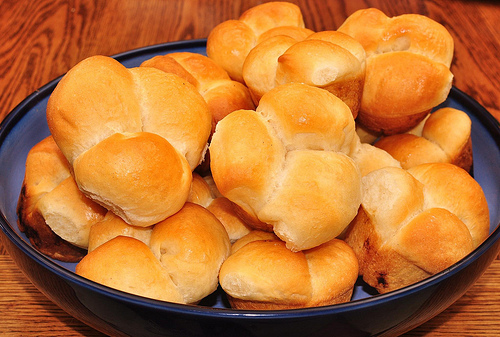 8) Bake rolls in hot oven of 425 degrees for 12-15 minutes, or until done. 9) When done, remove rolls from oven, brush with salad oil, butter, or margarine; turn out on wire cake rack to cool. Makes about 18. You can pre-order "Breakfast and Beyond" on-line from our website www.avenuehotelband.com . On the homepage, scroll to the bottom to the red box, inside you will see a PayPal "Add to Cart" button . Go ahead and click on the "Add to Cart" button. This will take you to a PayPal menu. just fill out your credit card information. It is a secure website. Or call us at 719-685-1277 and order the cookbook over the phone.